Innovation has been elevated to the forefront of discussions on the future of humanitarianism. Data-based, materials, communications, and logistics technologies promise to improve the effectiveness of humanitarian operations. This paper explores four ensuing tensions that need balancing. Some, including Unmanned Aerial Vehicles (UAVs), additive manufacturing, and certain data-collection technologies, require reviewed regulation to avoid disrupting other public goods or undermining particular values held by local populations. Several data-based technologies, and the general need to experiment with any innovation, must balance short-term benefits with longer-term risks. This is difficult in humanitarian emergencies given the urgency with which decisions must be taken, and because those deciding are generally not those shouldering the risks. Where judgement is exercised, there must be review and accountability. Data-collection technologies, UAVs, and biometrics may in some circumstances distribute risk onto populations in need of help for benefits gained primarily by humanitarian organisations and their donors, entrenching a power discrepancy that pervades humanitarianism in general. Several data-based and communications technologies promise to increase the autonomy of those caught in disasters. In scenarios where speed makes a crucial difference in terms of lives saved, such initiatives are extremely valuable as they help people to mitigate the risks they face before outside help arrives. 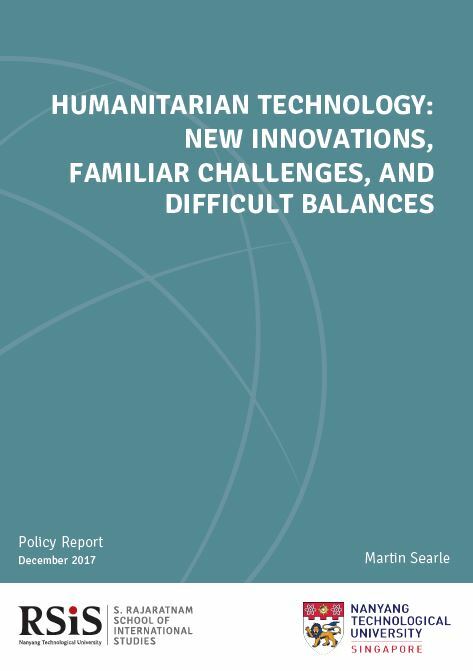 The challenges facing new technologies parallel general criticisms levelled at humanitarianism over the last twenty-five years, including that it can exacerbate conflict and poverty, perpetuate political marginalisation, and prioritise agendas of foreign powers rather than those in need. This is likely because those technologies do not engage with these criticisms, which are political rather than technical. This does not necessarily mean those innovations lack merit; however, it does suggest that they are unlikely to meet the high expectations expressed for humanitarian technology. Technologies increasing individual autonomy are an exception. These clearly challenge the potential to instrumentalise centrally-distributed aid and the exacerbation of power imbalances. With its technological expertise, Singapore can be an important voice in discussions about the humanitarian uses of technology. To ensure this comparative advantage achieves maximal benefit, Singapore ought to stress the nuances outlined in this paper both in its own research into the humanitarian possibilities of new technology, and in regional and global discussions on this issue. Martin Searle is an Associate Research Fellow with the Humanitarian Assistance and Disaster Relief (HADR) Programme, Centre Non-Traditional Security Studies (NTS Centre), S. Rajaratnam School of International Studies (RSIS), Nanyang Technological University (NTU). He previously spent six years at the international medical humanitarian organisation Médecins Sans Frontiéres/Doctors Without Borders (MSF). During that time he worked in South Sudan, Central African Republic, Kenya, India, Bangladesh, Myanmar and Malaysia on a mixture of conflict response, healthcare exclusion, HIV and TB treatment, and migrant and asylum issues. He also worked at MSF headquarters on communications and advocacy for the South and Southeast Asia operational portfolio.